When it was time to begin debating the merits of prospective host locations for the second Northeast Ski Blogger Summit, our group put several lift-served mountains on the table. Following several weeks of intense e-mail lobbying, we agreed on New Hampshire’s White Mountains. 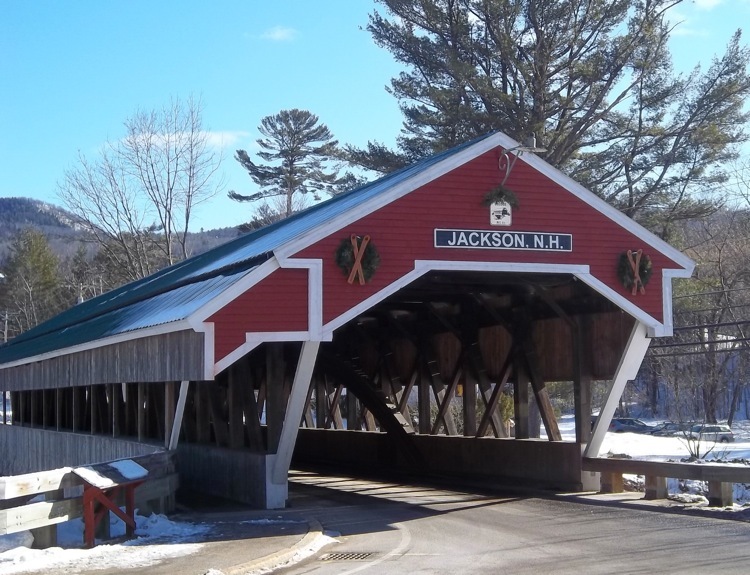 Based on a handful of key metrics — four lift-served ski areas (including state-owned and -operated mountains), similar annual snowfall totals, dramatic scenery, some atmospheric villages, and occasionally challenging weather — the region could be classified as a New England version of New York’s Adirondack Mountains. 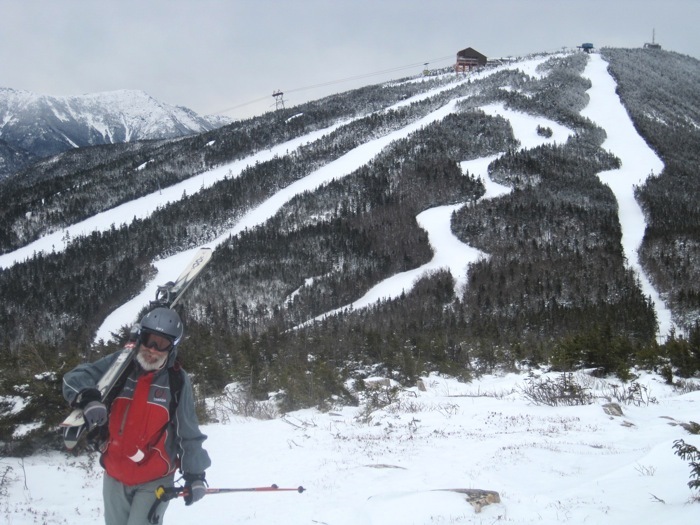 We planned our visit as a ski safari, with one day for each mountain: Cannon in Franconia Notch and Attitash, Wildcat, and Bretton Woods in the Mount Washington Valley. While that format makes it tough to get more than a quick overview of each mountain, everyone agreed that it’d be fun to investigate an entire region rather than only one ski area, as we’d done the previous year at Jay Peak. When I think abstractly about past ski areas, there are those that I generally remember as having sunny dispositions and forgiving terrain – places where you go and have a pleasant, out-for-a-Sunday-drive time. Then there are the, ahem, “force-of-nature” ski areas. The ones that combine challenging terrain with equally challenging weather. The ones where you like to brag about how far below zero the wind chill fell or how brutal the snow conditions were. Everyone has a mental list of ski areas like this and my personal force-of-nature mountains in the northeast have always been Whiteface, Jay Peak, and Cannon Mountain. As we schlepped our skis into Cannon’s utilitarian base lodge, the gusting winds, temperature in the mid-teens, and lack of recent snow were a good indication that while we weren’t in for a classic ski day, we were in for a classic Cannon day. Lift rides on the Peabody and Summit Quads were borderline laughable, with 40 mph gales blasting in our faces on the upper mountain. Most of the snow from a storm over the previous weekend had been blown who knows where, leaving cut runs with alternating patches of soft wind sift and, more often than not, rock-hard boilerplate. Once at the summit and pretty much anywhere we skied thereafter, views of the Franconia Notch and Mount Lafayette created a majestic, sometimes intimidating tableau. Cannon provides a nice variety of terrain, including rolling blue-square cruisers like Vista Way, zigzagging Upper Ravine, the steep Front Five trails near the base, a completely separate family area, as well as the mountain’s renowned off-piste, where an array of rocks, stumps, roots, ice and god knows what else may be lurking in case you get too comfortable. 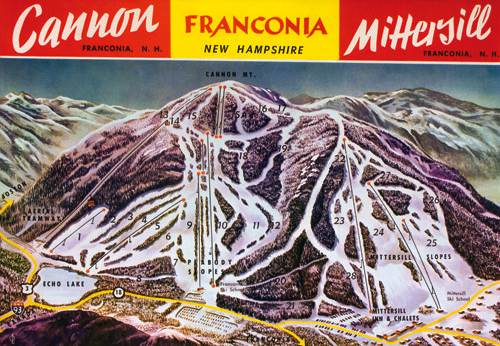 As a great value-added feature, Cannon is the permanent home of the New England Ski Museum (located near the tram base on the far looker’s left), which highlights local aspects of ski history that took on national implications. In addition, the roomy Cannonball Pub in the Peabody Lodge offers a nice selection of draft beer and food, including a satisfying version of the French-Canadian favorite poutine. And then there’s Mittersill. Even though it’s considered part of the Cannon experience, the mountain — a completely separate ski area directly next door that was founded by expatriot Austrians during World War II — deserves its own section. Following its final year of operation in 1982, Mittersill reigned for more than two decades as what could be legitimately be called the region’s worst-kept side-country secret. How badly-kept? During our inaugural season of downhill skiing (2000-01), my future wife and I had chosen Cannon as the venue for our first multi-day ski date and on our second ride on the tram, a friendly local on the tram convinced us to follow him all the way to the skier’s left on the Taft Run. We hiked up and over Mittersill’s summit with him, down a narrow connecting trail, and into a fascinating ski ghost town with a dilapidated lift shack at the top, rusting towers, a beautifully-pitched intermediate trail dotted with brush (Baron’s Run), and absolutely no one to share it with. As novices, we sometimes had problems dealing with the variable snow conditions there, but both of us went back three more times that day. The experience instantly transformed me into a passionate lost-ski-area fan. In 2009, after years of negotiations between all sorts of stakeholders, there was an exchange between federal and state land management authorities in which 100 acres of Mittersill’s upper terrain were officially handed over to Cannon. The agreement included the restoration of lift service to the mountain — a decision that leaves a fair amount of Cannon fans conflicted. Many argue that the state should’ve either left Mittersill as lift-assisted sidecountry or gone all the way in the other direction and added snowmaking along with the new lift. Regardless, with the exception of cutting a path for the new liftline, the mountain’s terrain has seen little to no alterations or maintenance, which means that you need to move when conditions are nice because they may deteriorate quickly. It’s this small window of opportunity that contributes to making Mittersill one of the northeast’s most unique ski experiences. It’s rare to find a ski area about which I have or had no preconceived notions, good or bad. Over the years, I could count the number of TRs I’d read about Attitash on one hand and while none of them painted the mountain in negative terms, neither were they overly effusive with praise. As we arrived at the Attitash Grand Summit Hotel in the fading late afternoon light, the view from the Route 302 access road didn’t offer much indication what awaited us. So there you go: a blank canvas. Being more or less at the halfway point between the four mountains we were visiting on this trip, the Grand Summit turned out to be an ideal headquarters for us. Our group, composed of skiers who generally aren’t in the habit of overnighting in slopeside accommodations, was delighted to experience an atypical luxury — a ski-in/ski-out hotel that allowed us to take our time getting dressed, eat a leisurely breakfast, and get on the lifts by 9 am. The morning started on a positive note. After the previous day’s flat light and high winds, the skies had cleared overnight, providing us with spectacular views of Mount Washington Valley. We spent getting the first two hours warming up on Bear Peak, whose trails roll nicely with the mountain’s topography. Moreover, the detachable Flying Bear quad allowed us to pile up multiples of the 1,450 vertical feet quickly. While the majority of the bloggers consider themselves primarily off-piste fans, everyone nodded with approval after every high-speed run on the consistently-pitched groomers. After lunch, we were joined by hard-charging Marketing Director Thomas Prindle, who took us on a Cook’s Tour of surprisingly challenging tree skiing on both mountains. By the final bell, all of us agreed that Attitash, particularly the Bear Peak side, was worth a return visit. Moreover, the resort’s location, only a few miles from North Conway — one of New England’s most popular ski towns with a selection of restaurants, bars, and outlet stores if you’re so inclined — makes it an excellent center of operations for a multi-day White Mountains visit. Due to its far-flung location (a seven-hour drive from where I live), Wildcat had always been firmly ensconced on my northeastern gotta-ski-there-one-of-these-days list. 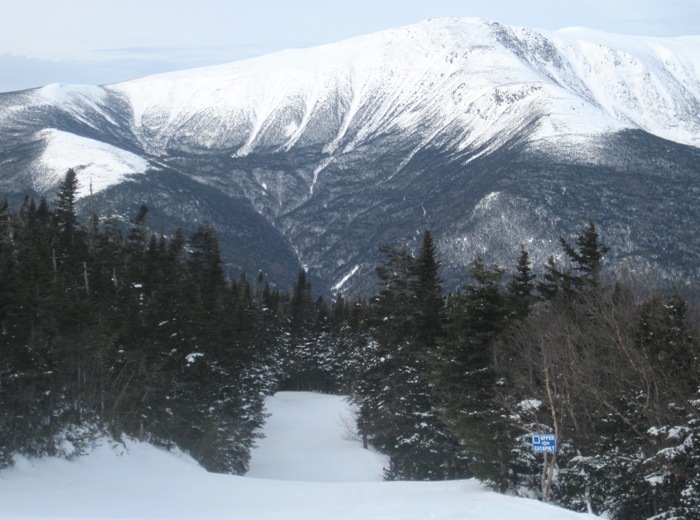 I’d heard all about the stellar views of Mount Washington, the 2,100 vertical feet of consistent pitch, the winding, character-rich trails with cat-centric themes (including several that had been cut by the Civilian Conservation Corps during the Depression), and some great tree skiing. Since Wildcat is 100% on National Forest Land, the only base infrastructure is a bare-bones lodge whose exterior didn’t look like it had been painted in many moons. Two members of our crew had a long history of skiing at Wildcat, but hadn’t been there in a while, so they were happy to revisit some favorite trails from their past. Both mentioned that several trails had been widened; however, not to the point that they had lost their original character. It’s hard to avoid the presence of Mount Washington when you’re skiing in the White Mountains. The iconic peak is visible from just about everywhere in the region, but at Wildcat, it’s right in your face on every run. 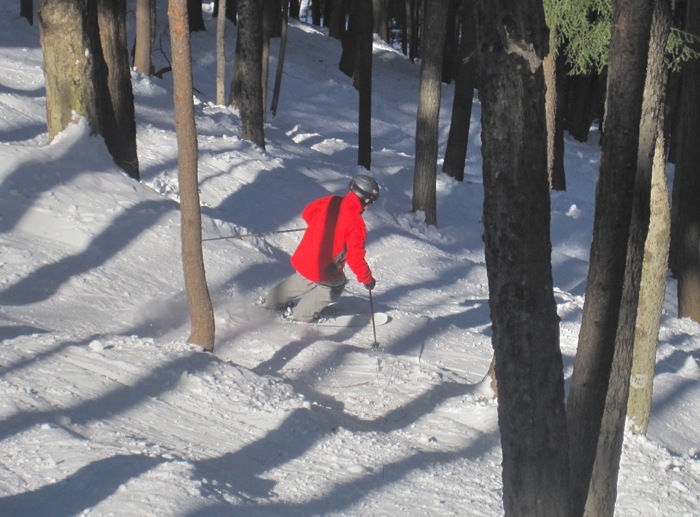 Wildcat has benefited from its 2010 purchase by Peak Resorts, the Missouri-based ski-area operator that confidently moved into the northeast with aplomb over the past decade. The company kicked off its New England strategy by reopening a long-shuttered New Hampshire ski area (Crotched Mountain), then bought Attitash and southern Vermont’s Mount Snow, and finally added Wildcat to its portfolio. 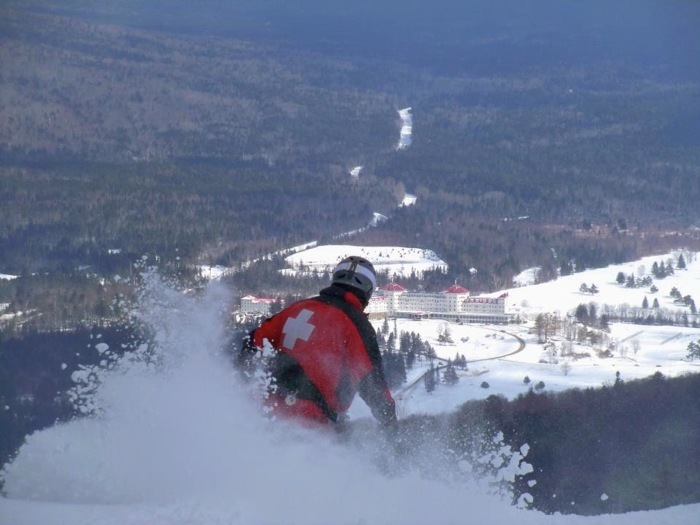 Day tickets and season passes are good at both Mount Washington Valley mountains, which provides a lot of added value by allowing customers to take advantage of Attitash’s snowmaking power during the early season and then enjoy Wildcat’s superior spring conditions and longer season. It didn’t take very long for Wildcat’s no-nonsense ambiance and archetypal east-coast terrain to make me understand why it’s referred to as a classic New England ski area. Moreover, at every NH ski area on this trip, I made a point to sample the Clam Chowder. All were great — granted, it’s tough to screw up the recipe — but Wildcat’s was exceptional, so I recommend you giving it a try the next time you’re there. Following a challenging early-morning drive over Crawford Notch in a blizzard, I realized that a run of almost nonstop skiing over the previous two weeks (seven days in Québec followed by four days in Vermont and New Hampshire) had finally taken its toll on my legs. Steep terrain was not in the cards for me on the final day of the trip. Returning to my earlier metaphor, I was ready for a Sunday-drive type of day and conveniently, Bretton Woods — the state’s largest ski area with four high-speed quads covering predominantly gentle, rolling slopes — was on the menu. Given the half foot of fresh snow that had fallen overnight, my goals were modest: maximize vert while touching the refrozen base as little as possible. It worked out exactly as planned. I spent the entire day floating through soft powder, alternating between twisting cut trails and an extensive network of mildly-pitched glades that are custom-made for introducing lower-level skiers to the joys of tree skiing. Instead of having to commit to a long tree line all the way to the bottom, you can pop in and out of these glades at will. Bretton Woods makes no bones about its target audience: families with novice-to-intermediate skiers; thus, it wouldn’t have been a great choice for the expert-level members of our group; however, it was the perfect choice for me on that day. Moreover, the visit served as a useful reconnaissance mission — Bretton Woods would be an excellent place to bring my wife and son for a two- or three-day vacation. With all that diverse, confidence-inspiring terrain framed by an incredible view of Mount Washington and the resort’s iconic hotel, it’s easy to see why the resort is so popular among its demographic: upscale New England families (similar to Windham in the Catskills). By the end of our stay, we’d hit four varied ski areas with unique personalities, eaten in a handful of great restaurants, and enjoyed some excellent microbrews (Tuckerman Brewing Company’s 6288 Stout is now a favorite). While the Whites don’t receive close to as many internet accolades as New England’s other major ski region, Vermont’s Green Mountains, we all agreed that northern New Hampshire was worth the extra bit of driving. Great report, and glad you made it up to northern NH! Thanks too for mentioning the Ski Museum! I did a similar trip to NH a few years ago. The trip turned out exactly as you wrote it. We actually skied Black instead of Cannon. North Conway is really worth the drive from the NY Metro area. This well written article nails the great skiing in the area. I need to return. Thanks for the reminder.